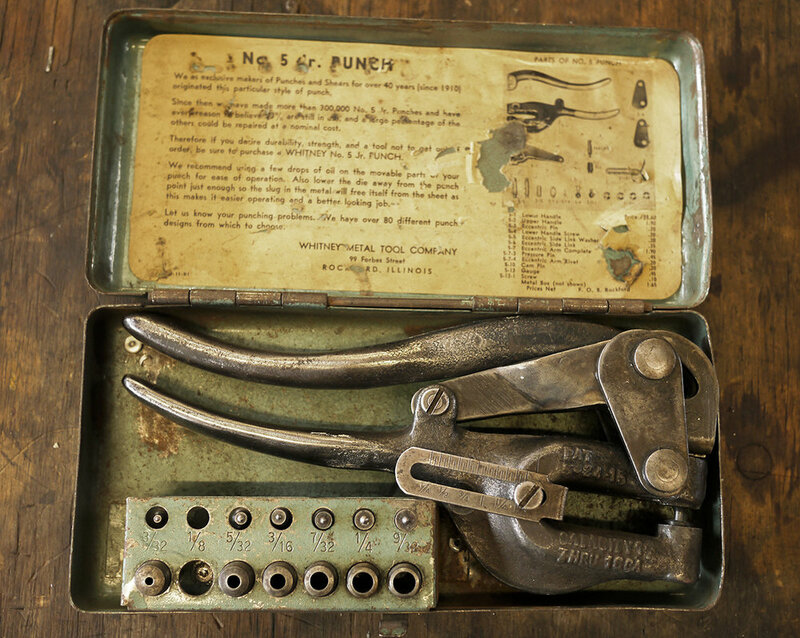 Gear | One of my favorite tools is my Whitney 1 ton hole punch, patented in 1913. I have the original design that has a forged steel frame, and all the rest of the parts are made of wrought steel. The model after it had a different design of transfer arm that is a casting, but it too is a fine tool. My punch has ten sizes of punches and dies from 1/16 inch through 1/4inch. The 1/16" size is not usually supplied with the tool, and I bought it extra. Though I reserve my punch for silver, copper, and non, ferrous metals, the punches work fine on soft steel. I polished the faces of the dies so they leave minimal marks on metal. The punch sets were sold in nice steel boxes, though I made my own box of dovetail jointed teak wood. You can find the punch sets on Ebay, and you should seek one with all the punches and dies in good shape. Replacement punches and dies are available from McMaster Carr, but are expensive. I think punch and die sets that make square holes are available from Roper Whitney. Roper Whitney, and other copycat companies, still make this tool, usually called the Number 5 Jr. model, but the frames appear to be castings and the workmanship is not as good as in earlier days. I like old tools in good working shape and did some hand engraving on the handles of mine.